It has been three months since we moved to Wyoming and though we miss our Nantucket life and friends, we’re now fully integrated into our new community and finding things to love. I started a La Leche League group in April and have been pleased with both the turnout and the support from the community, including getting a $500 grant to start the lending library. The girls and I have found all sorts of fun activities to do here and I am in the process of (hopefully) starting a homeschool co-op, so Wyoming is feeling more and more like home. I don’t think I’ve ever met a town more filled with friendly and welcoming people. Of course, it doesn’t hurt that Chris is somewhat of a local celebrity — this town is so starved for good food everyone is super excited when they hear what brought us here — and both of us being in the paper on the same day has been getting me recognized around town, too. There was a huge article about Chris’ restaurant in the business section of the paper and I was on the cover in an article about breastfeeding on Mother’s Day. Suffice it to say, we have both been thoroughly welcomed to the west. I have to say, this adventure is turning out much less scary than anticipated. I did miss daffodil fun this spring, but I can’t say I’m missing the raucous Memorial Day crowds this weekend. And we’ve discovered that = a milk-and-cookie skype date can go a long way during any moments of island homesickness. We may have made Wyoming our home, but we’re still in the process of trying to find our home in Wyoming. When we first moved here, we moved into an apartment which was the only rental option we could find from a distance. I was pleasantly surprised with the apartment’s location, and of course the lower cost of living allowed us an apartment that is considerably bigger and in better condition than our house on Nantucket. Initially, I expected that we would live here for a year or two, get to know the area, pay off more of our student loans, then start looking for a house. When we moved in February, we happily signed a 13 month lease. Now, three months later, thinking about finishing that lease feels like staring down the barrel of a gun. This is the first time we have ever lived in an apartment, and while the we’re in one of the nicest complexes in town and I’m still loving all the extra space and newness, I am completely over not having a yard. Living in an apartment with kids is ok. Living in an apartment with a dog is doable. But living in an apartment with kids and a dog is down right awful. When the weather is nice, it’s not too bad. 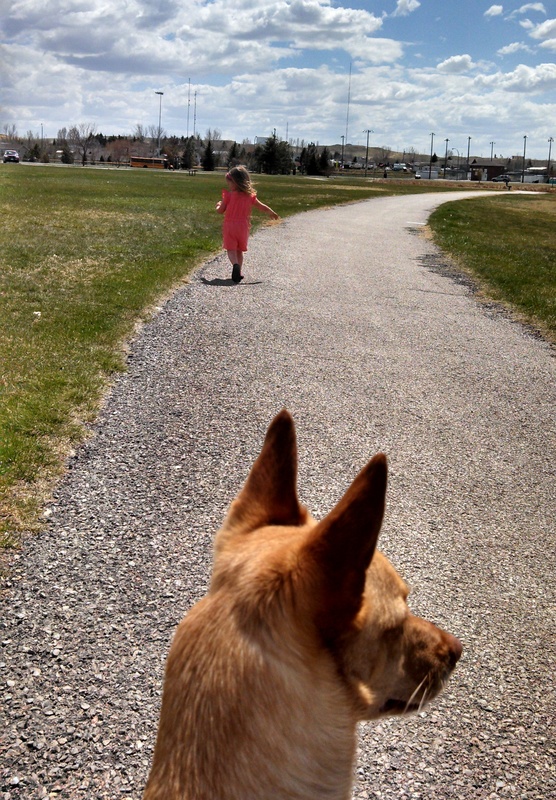 We put on our walking shoes, roll out a stroller and set out to get some exercise and enjoy the sunshine. There are tons of parks in our new town; there are plenty of places for play and fun that also allow Pip to get out of the house. But when it’s snowing or raining or so windy that Nora is literally getting blown over, not having a yard to let Pip out in is a serious challenge. If the girls can’t go out with me, I can’t take him for a walk or do anything other than stand in one spot which allows me to watch our door and rush to get back inside. Zara is no problem inside by herself for five or ten minutes. Nora, on the other hand, is just capable enough that she can get into big trouble if left alone for five minutes. I nearly had a heart attack once when I walked around the corner of the building with him only to return and find wide open the door I had deadbolted shut. That taught me to never take my eye off the door and, as Nora is so good at getting into things, I also hurry Pip quickly back inside. I feel so bad for our doggie who is used to being able to go outside whenever and forever long as he wants. The dog and children combination makes apartment living a true challenge, and thus we have officially started searching for houses. Living on Nantucket, owning a home was a fantasy — it was something we only thought could potentially happen through a 40B development like Sachem’s Path. Similarly, home prices when we lived in New York were beyond our grasp. But here, here it isn’t only realistic to think about buying a house, it is actually cheaper for us to own a home than to rent. We put a bid on a HUD house spontaneously last week, just before the bidding period ended, and though we didn’t get the house (lost it by $500, I’m going to be kicking myself for weeks) just beginning the process was exciting. We have more house tours planned for this week and I’m hopeful that we will find something we love soon, which means we might be able to again look forward to gardens and clotheslines and watching our happy dog laze in the grass. After, of course, we survive the craziness that it moving all over again.